How Come I Don’t Have Any… Tesla, Netflix or Facebook? One of the most frustrating common questions financial advisors get from clients is “Why didn’t you buy that XYZ hot stock for my account?” People watch the hype on CNBC or read financial press and get all excited about Elon Musk (Tesla) or Twitter IPO. By the time these companies become household names in many cases the big run is largely over and the volatility goes through the roof. I prefer to invest in domestic stocks through index ETFs as opposed to actively-managed funds. There are many reasons for this including lower expense ratios, persistence of performance and style drift. I won’t get into the detail of that here, but one of the “side effects” of investing in index funds is that you DO end up owning every stock in the market, including the hot performers. Let’s make a few assumptions and see what a typical investor might own in their index portfolio. For this example, we will take a total of $1,000,000 invested in a 60/40 portfolio. Let’s assume 2/3 of equity allocation is invested in domestic stocks and that it’s split 70/30 between large and small cap ETFs (Exhibit 1). I typically use Schwab ETFs in client portfolios because they have the lowest expense ratios and are free to trade in Schwab accounts (which happens to be our custodian). The analysis of resulting domestic stock portion is shown in Exhibit 2. The 70/30 split has expense ratio of 5 basis points, about 2,500 holdings, 58% large cap stocks and is slightly tilted towards growth stocks (per Morningstar classification). The numbers for U.S. Broad Market ETF are also shown for reference. Now let’s pick 10 hot stocks that get a lot of attention due to their performance and media popularity (subjectively selected by me). With our $400,000 position in domestic stocks, here is what we own: $250 of TSLA, almost $400 of NFLX and $1,700 of FB (Exhibit 3). We even have $56 worth of Twitter or one entire share. TWTR went public on November 7, 2013 and was added to SCHX on December 23. Exhibit 4 shows the top performers among U.S. stocks with market cap over two billion dollars. You can see in my prior post reviewing 2013 that the best areas to invest in lately have been Solar, Biotech, and Social Media/Internet. Out of 20 big gainers only four are well-followed names from Exhibit 3 (highlighted in grey). The rest are small companies heavily concentrated in biotech and technology areas. 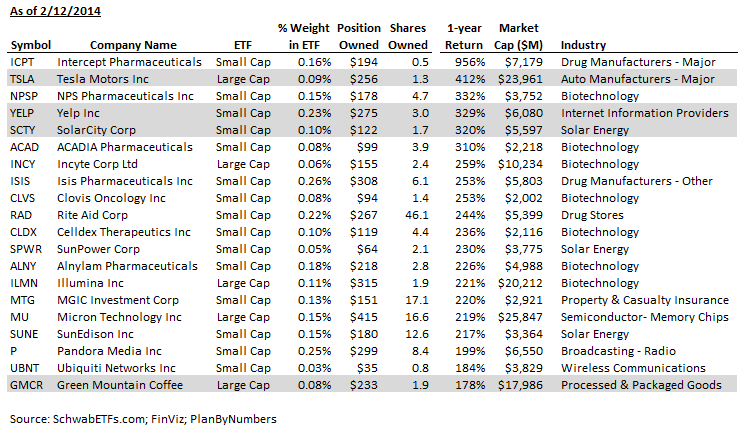 A year ago, how many of you could have picked Intercept Pharmaceuticals, Rite Aid or MGIC Investment to be big winners? I know I couldn’t! In the interest of full disclosure, by indexing you also own the biggest losers in the market, such as a nice bouquet of gold and coal miners that have lost 30-60% in the past year. The upshot of that is that yesterday’s losers often become tomorrow’s darlings and vice versa. The beauty of this approach is that you don’t need a million-dollar portfolio to own any and all stocks. Index investing is a very democratic and [almost] anyone can open a Charles Schwab account with a minimum deposit of $1,000. 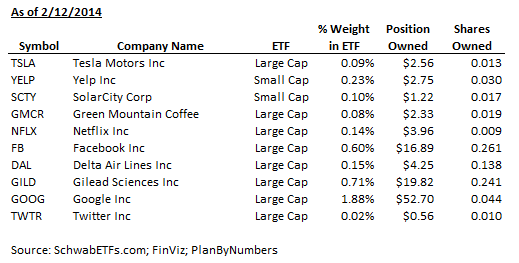 After that you can buy Schwab ETFs with ZERO commission in one-share increments (about $50). (Note: I am not promoting Charles Schwab in particular, just using them as example since we are looking at their ETFs). Exhibit 5 shows the exposure for the same portfolio as above but with only $10,000 overall investment. Google (GOOG) is a twelve hundred dollar stock, but you can still own 0.044 shares worth $52.70. Similarly, you would own 56 cents worth of Twitter stock giving you a tiny ownership in the [potentially] next big thing! This entry was posted in Indexing, Investing and tagged Bottom 99%, Elon Musk, FB, hot stocks, indexing, NFLX, passive, TSLA, Twitter, TWTR on February 20, 2014 by Denis Smirnov.